Relief: It was so nice to hear the words, "Come to the hospital in a hour Lindsey to have this baby" when I called the hospital at 5:30 am last Thursday morning. This was after I was scheduled to be induced on Wednesday but was bumped to Thursday. Fear and disappointment: I felt this when my doctor informed me that I might not be giving birth on Thursday (after being on the pitocin for two hours) because I wasn't dilated enough and he didn't want to put me at risk for an unnecessary c-section. More relief: When my doctor decided that I had progressed enough to stay at the hospital and give birth on Thursday. The relief really came when he allowed me to get my epidural after going through heavy contractions for two hours. I must be a wimp because I have no idea how women can handle giving birth naturally. Amazement and again more relief: When I only had to push three times to bring Madison into the world. This was great because I had to push for two hours with Sadie. Love: It was crazy to me how much love I felt for Maddie right when I saw her. I was afraid that there wasn't any way I could love someone as much as I loved Sadie but the extreme love I felt for Maddie came so naturally. Fear and relief: Fear when I saw how big Madison's nose was (I was afraid she took after her Dad in this area) but I was relieved a few hours later when I saw that her nose had just been swollen and had gone down considerably. Joy: To see how excited Sadie was to see Madison for the first time. Granted, I could tell she was a little jealous by all the attention Maddie was getting, but it was a great feeling to see my two little girls together for the first time. Overwhelmed: The thought of taking care of Sadie and Maddie is still too much for me to handle. I know it can be done. I'm just looking forward to when we work out our new schedule and get back into a routine. Excitement: When I thought breastfeeding was going so much better this time around. Discouragement: When I found out that Maddie had lost over a pound in a few days and that she needed more milk then I could give her. Frustration: When Madison won't wake up to eat. Happiness: Watching Blake hold Maddie. He is so sweet with her. Thankful: Having my parents take Sadie for the day so that I can get some sleep. Guilt: Knowing that Sadie is going through a transition and not wanting her to feel that she is being bumped out of her place. Awe: As I hold Maddie in my arms, I can't get over how beautiful and perfect she is. I feel so blessed to have her as part of our family. Pain: I'm talking physical pain. It seems like the minute I get over one of the physical pains of giving birth, another one shows up. Yuck. Hope: Knowing that everything is going to be fine. My physical pains will go away. Madison will learn to eat because she is a strong, healthy baby. Sadie will forgive me and will eventually decide to be my friend again. And, knowing that I'm not alone and that Blake is right by my side is enough for me to keep going. I have hope because this is a wonderful time of my life. 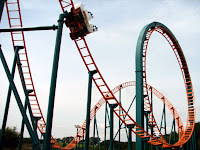 Once my hormones settle down a little, I will be able to enjoy this roller coaster a little bit more. Instead of being scared and closing my eyes, I will be able to let go of the bar, raise my hands over my head and enjoy the ride. I definatley felt all those things when I had my second. But in my opinion, it is funner having 2 (once you get into a routine and all that.) Congrats again! I must say, I'm approaching the two week mark tomorrow and I am noticing a big difference in how I feel. Hang in there! That post makes me feel warm and fuzzy inside, Lindsey - especially the section about "love." I can't wait to see you guys at Christmas! Your girls are adorable by the way! Congrats again!!!! One more thing...How is Maddie eating now? Maggie dropped a lot of weight in the hospital too and they were having me supplement with formula because they said she dropped too much, but once my milk came in she started eating a little better and finally started gaining weight. I was really worried though, thinking I wasn't giving her enough to eat. Nursing has been my biggest challenge to date I think. It is definitely not easy. Do you feel the same? Anyway, I just wanted to know how that was all going now? I checked your blog and was so happy to find out you were about to have your second and then to see her so soon is fantastic! Hang in there, it does get better. Some days will go by so well and others you'll want to throw in the towel and give up! Our second also was not demanding and wouldn't eat too often. DO NOT PANIC and try not to worry. She'll start to eat more often; she's just adjusting to this new world! Congrats and have fun with her while she is so small! It will be rough for a while, but when the girls get to the age where they play together, you'll be glad you had them so close in years. Fights are difficult though. It is sooo much fun to watch and listen to Lily and Macy play together. Congratulations!